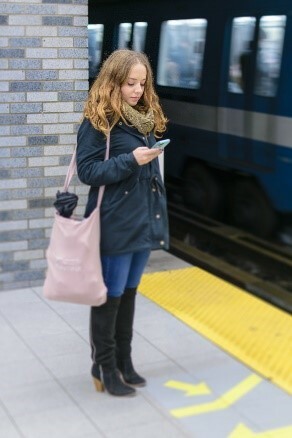 My daily commute on Montreal’s underground transit system got a whole lot more reflective last Friday, as I read Barbra Gibson’s fresh take on everyone’s dependence on technology, and the tendency to “normalize” people when it comes to universal design and rehabilitation. Her arguments took me through various stages of bargaining, discomfort and ultimately reflection that things need to change in our practice as Occupational Therapists (OT’s), all in the 45 minutes it took me to get to the McGill campus. What follows are my opinions on a few of her points. A form of person-technology assemblage that resonates with many, author in photo. The article challenges the idea that dependency on technology is just for rehabilitation clients, and argues that we are all in someway dependent on it. We are all part of assemblages, or a whole that consists of technology, our physical bodies and others in our social circle. These assemblages change depending on the technology we are currently using, with whom we are interacting and in what environment. This notion fits well into an occupational therapist’s mentality; our end goal does not necessarily need to be technology-free, we simply want to enable our clients to function in the best way possible. I spent most of my summer in my second placement trying to find technology that best fit both my client’s and their family members’ needs and ultimately making their assemblages work for them, even if it involved using the technology non-conventionally. I credit my supervisor for pushing me to think outside the box in my solutions, and really listen to what my client needed. As such, I whole heartedly agreed with Gibson’s take on this which made me bargain, or argue that my profession’s focus on function, with or without technology, still embodies this ideal. Gibson also demonstrates how universal design, although innocent enough in theory, is essentially trying to design towards a universal human or an average person. 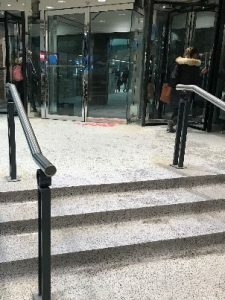 Coming from Montreal, I feel like any strides towards accessibility are much needed, (I have seen WAY too many accessibility features that require one to use a staircase to reach them). However, Gibson made me question this ideal; what about the people who do not fit the universal person? Those who need special adaptations, or may not access things in the same way that an average person would? I have been so used to holding universal design and Montreal’s dire need for it as the ultimate end goal, that I forgot to think about what this really means, and how it can still exclude people. Handicapped accessible doors and stairs? My view of occupational therapy was most heavily challenged, when reading Gibson’s case studies of clients who use crawling and riding on a skateboard as ways of mobilizing in their environments. She argues that most rehabilitation professionals would not consider these as developmentally appropriate ways of functioning. Just like that, the last leg that I was defending my profession on was swept off the floor; I was all too quick to argue that because we focus on functionality and not independence in the traditional, western use of the word, we as OTs do better than other domains of healthcare. However, we do still have an idea in our heads of what functionality is; with respect to mobility, our client is considered functional if they can walk safely, over a functional distance. Would it be okay if my client’s form of mobility was crawling? Even if I am personally okay with that, and it works for my client, am I projecting that view to them? I would wager a guess that entering a rehab department and seeing posters of rehab professionals helping people walk using gait belts and walkers, does not exactly sell our acceptance of other forms of mobility. Although my ideas were challenged through reading this article, further reflection on these ideas and our in-class discussions helped me come to terms with questioning them. It is okay to want to change ideologies that are inherent in our practices, and we can do this while still being people with good intentions, and who remain proud of their profession. Realizing the way in which our practice is perceived by clients who have lived experiences with a disability is a key first step in changing our mindset to be suitable for all. This post was written as part of the Design of Assistive Technologies POTH 625D, where students are given the opportunity to write about their course experiences. Published by spot on April 11, 2018 at 11:32 pm under Assisstive Technologies, Occupational Therapy, Universal Design.